Day (13), 22nd July 2014. Now this Blog of mine will cover the details of our (Gurudatt Kamath & Ashok Parimoo's) journey, that was driven through NH-3, (i.e. 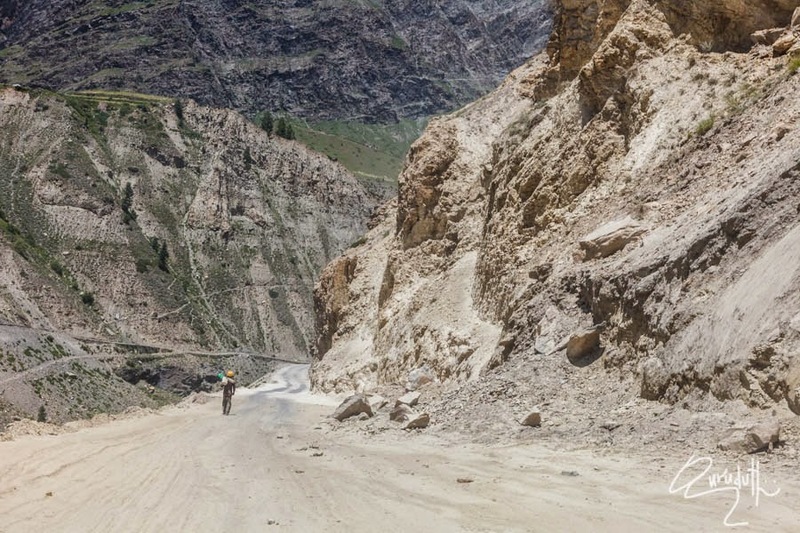 the National Highway that runs from Manali to Leh). 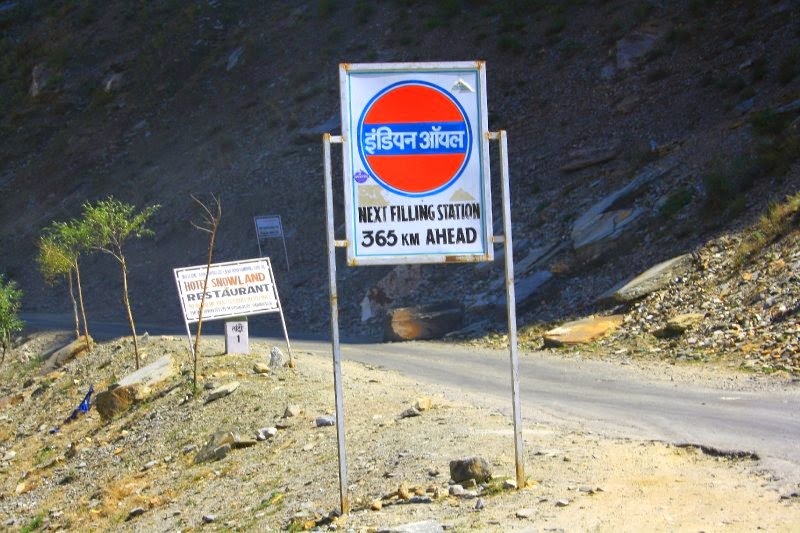 But we joined the NH-3, at Koksar village that comes after Rohtang Pass, (Towards LEH). 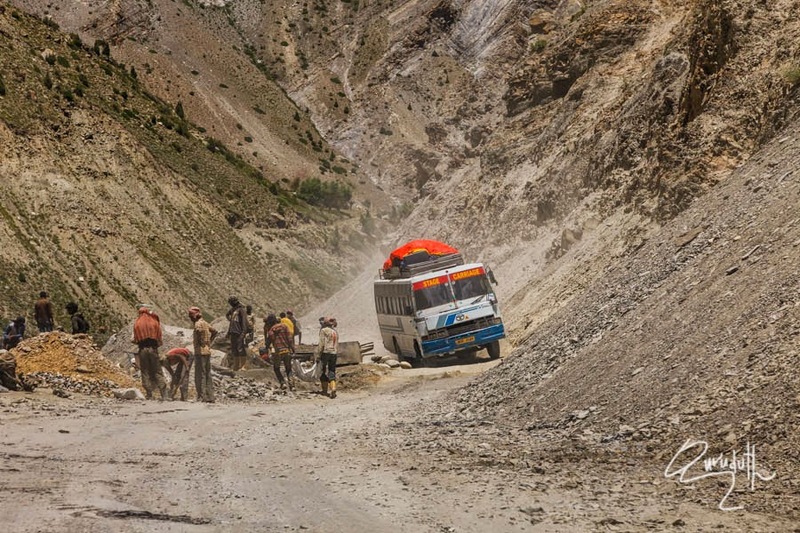 The most scariest, adventurous, treacherous and the toughest motor-able terrains that we drove through, was the (Hindustan-Tibet Road, NH-21 and Kaza Grampoo road via Kunzum La Pass). It was an utmost, enchanting endurance test of man, machine and the sprits? 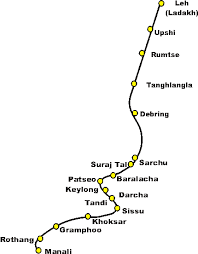 (1)-NH-21 (Hindustan-Tibet Road) i.e. 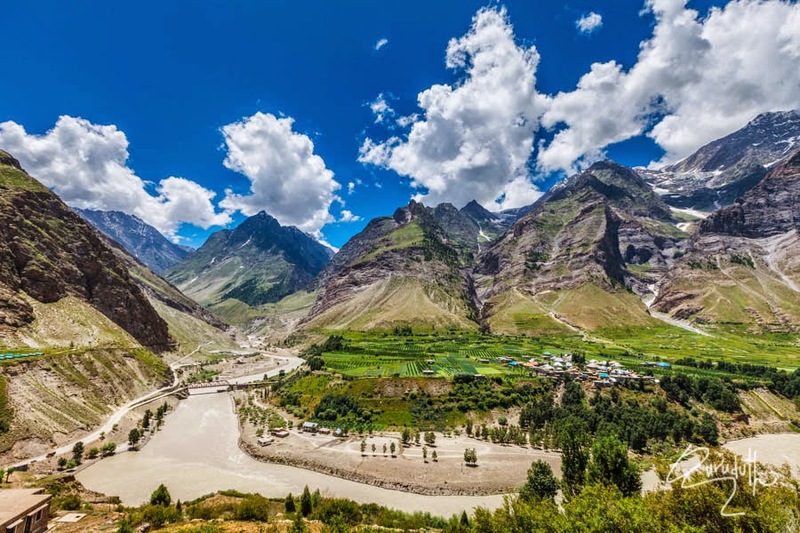 (from Chandhigar to Kaza Via Shimla, Kinnaur valley and Spiti Valley). 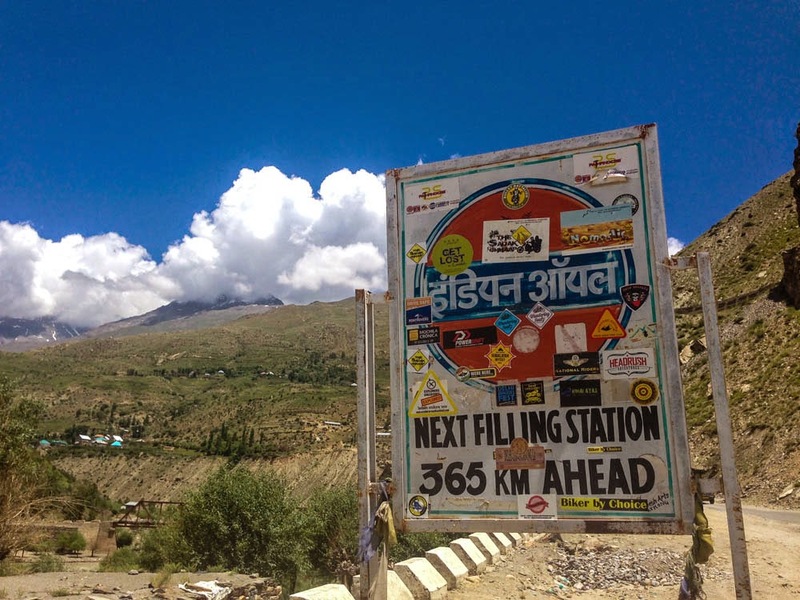 (2)-And then driving through NH- (From Kaza to Grampoo via Kunzum La Pass Via Batal and Chandartal Lake, Chooti Dhara Nalla, Badi Dhars nalla and Pagal Nalla). Now we would be driving on HN-3, i.e. 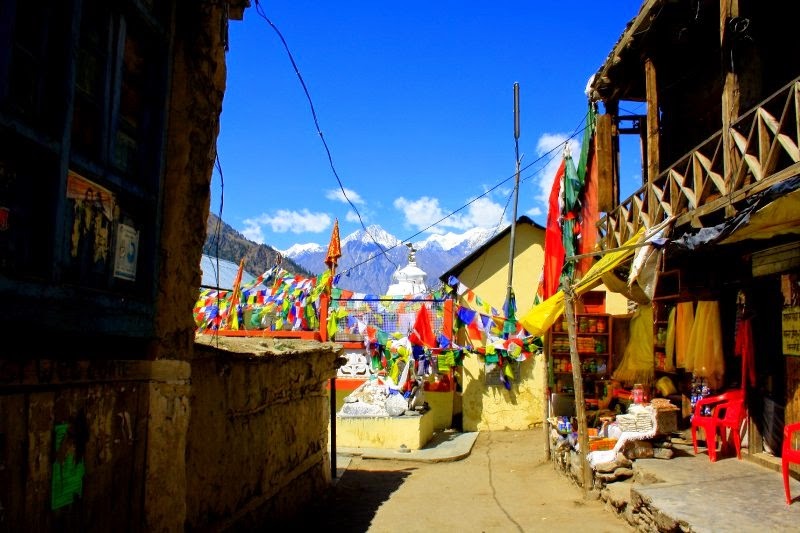 through the (Dev-Bhumi); the land of Gods (Himachal Pradesh) to the roof top of the world (Ladakh) reign that’s called “The abode of the dancing Dragon. 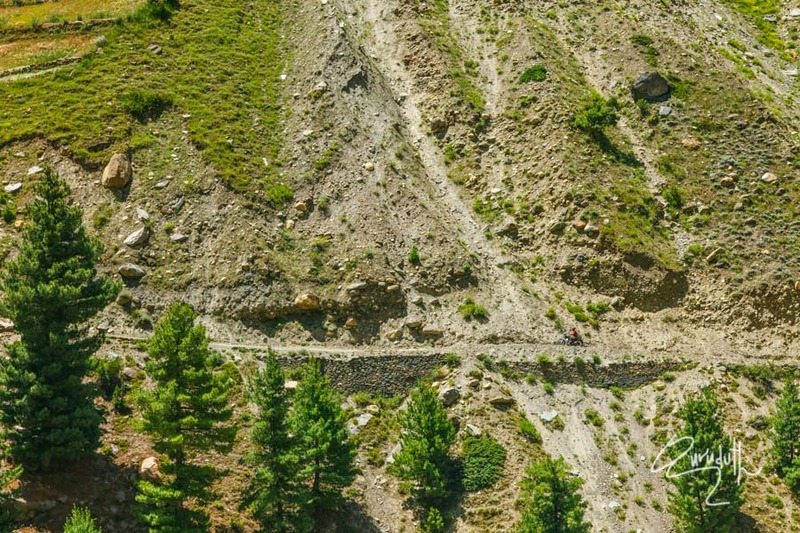 Because this formidable high altitude road is so hazardously breathless and climatically the most un-predictive. 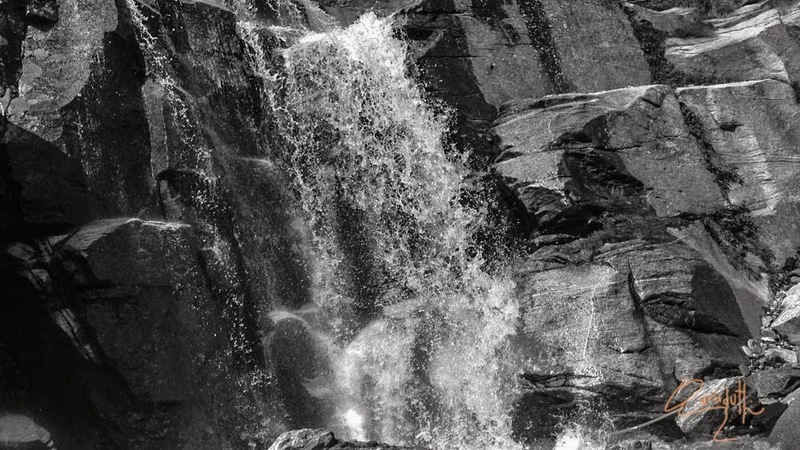 But at the same time, the thought of braving this dangerous terrain, the world has ever offered, definitely pumps more adrenalin into the thrills of the adventurer’s mind, body and soul. 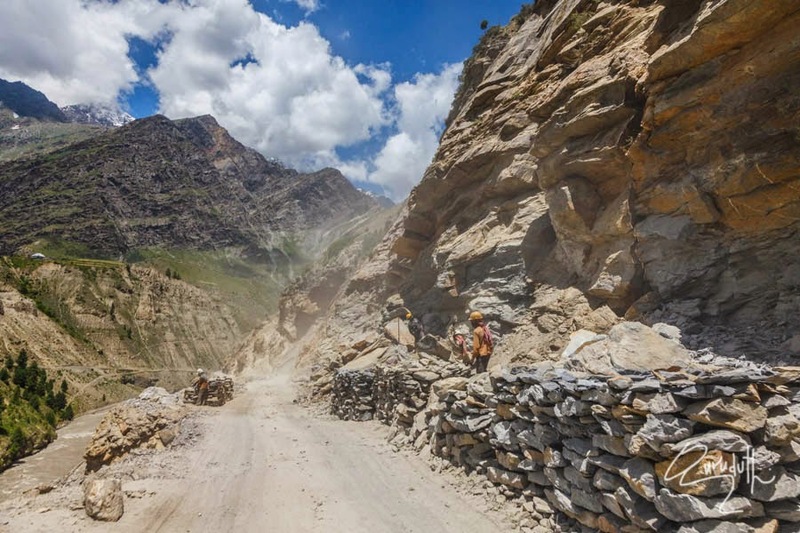 As per my driving experience this road of NH-3 (From Manali to Leh) is though tough but it is definitely not as treacherous and hazardous as NH—21, (Hindustan-Tibet Road) or the Kumzum La Pass road. 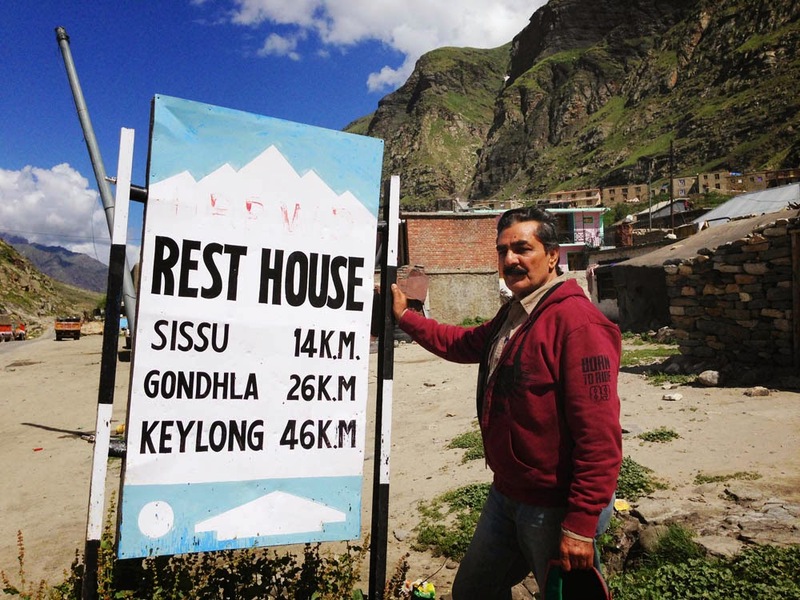 Now our further incredible and the adventurous journey starts from Grampoo to Jispa Via Koksar---Sissu—Gondhla---Tandi-----Keylong---Patseo----Jispa. 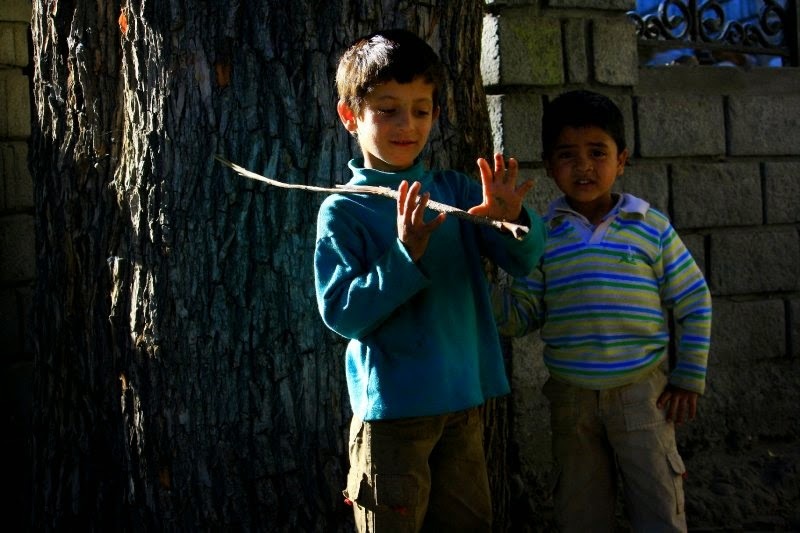 Once we crossed the Grampoo village we had a big sigh of relief. Because the treacherous and the most nightmarish stretch of the road was finally over. 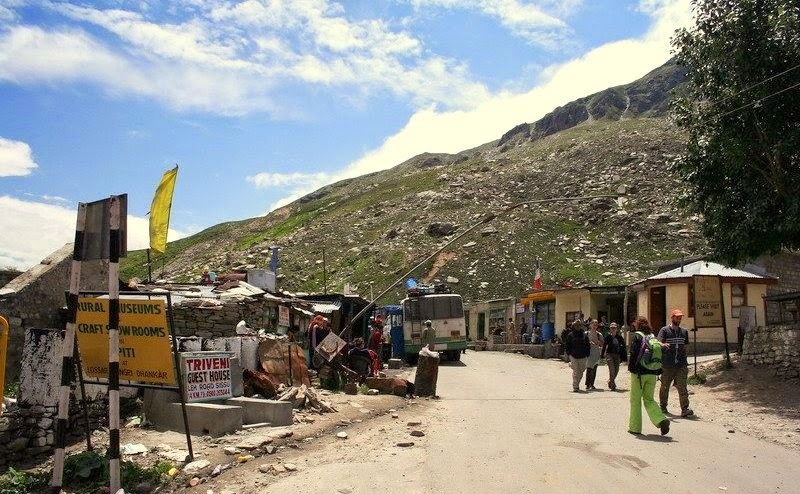 A little further from Grampoo village road, finally we joined at a NH-3 junction of the road, where the Left side of the NH-3, leads to Manali via Rohtan Pass (13,500ft) and the Right side at the junction of HN-3 leads to Leh via Kookar etc. 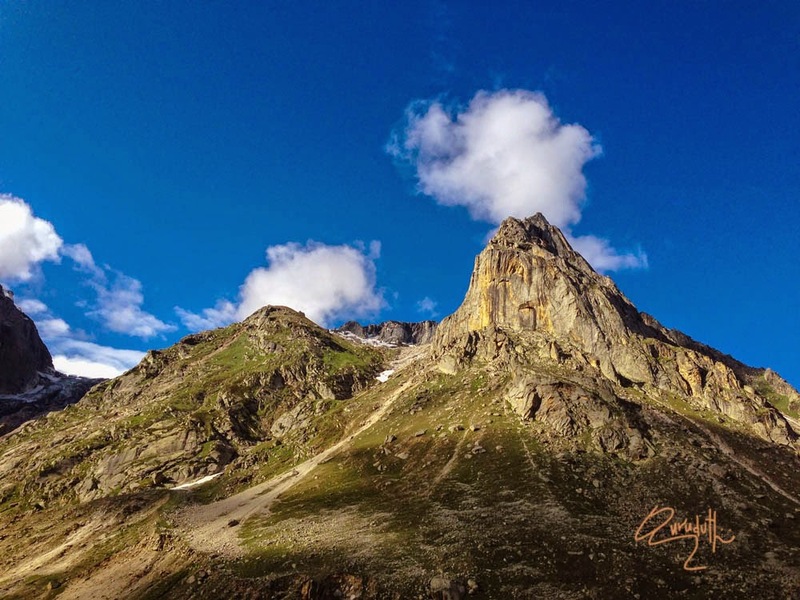 Rohtang Pass is at (13,500 ft) above MSL. 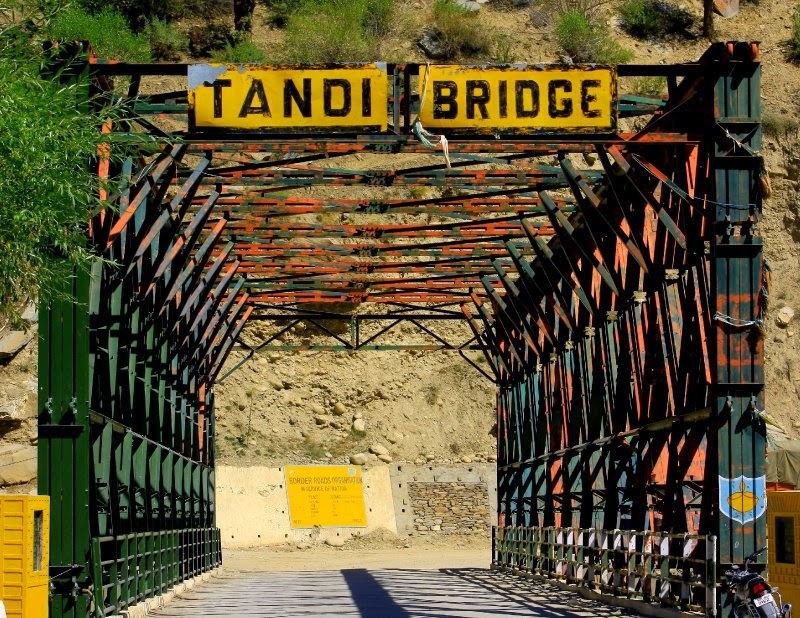 This pass is an important milestone on the Manali – Leh route, as it is the gateway to the Lahaul-Spiti valley, as well as for Ladakh valley. 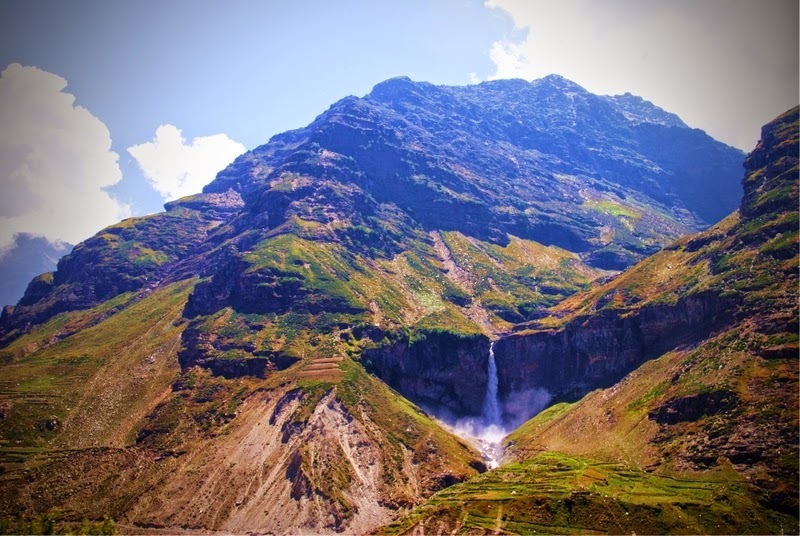 Though we didn't drive through Rohtang Pass, but I just want to write a brief introduction about Rohtang Pass. 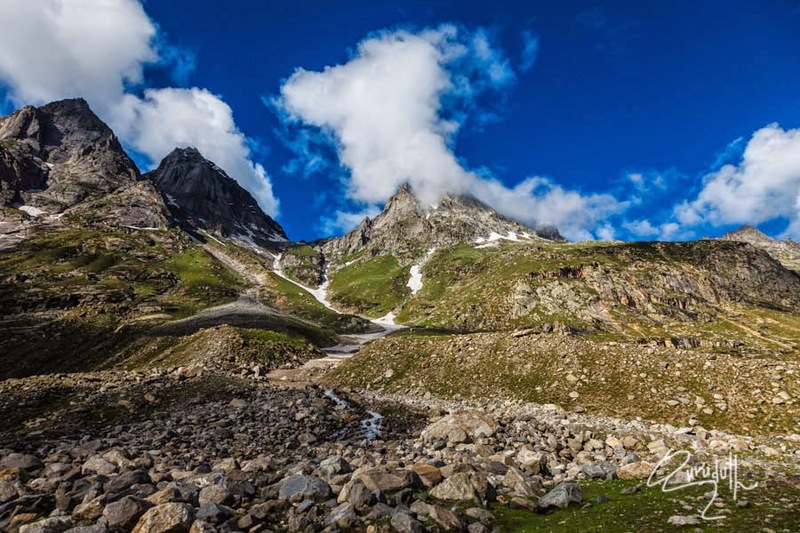 Rohtang pass (altitude 13050 feet) separates Kullu, from the exotic charm of the Lahaul valley. 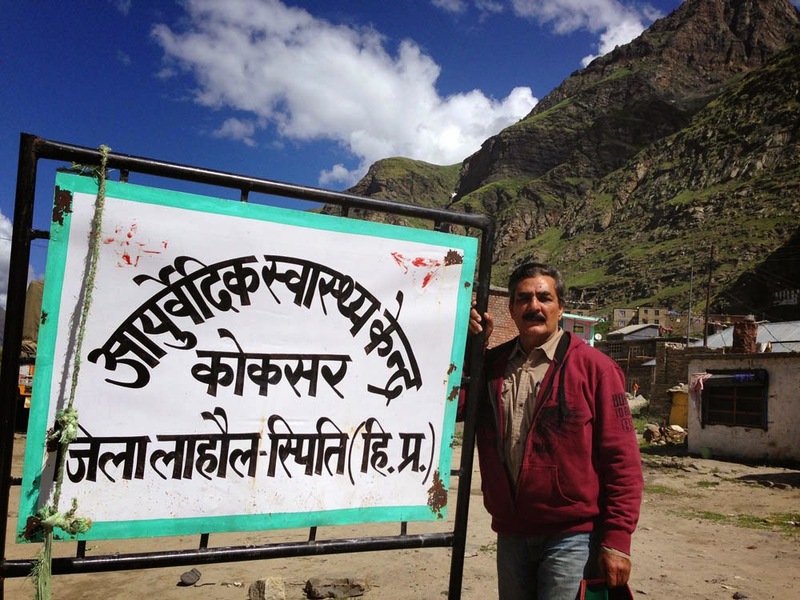 In Tibetan Rohtang means "a heap of dead bodies" and the pass stands true to its notorious name. Every year it must take toll of life and property. This is so because after 11 A.M. sudden blizzerds and snow storms calledBiannas are only to be expected. The pass becomes all the more hazardous to negotiate due to frequent avalanches. 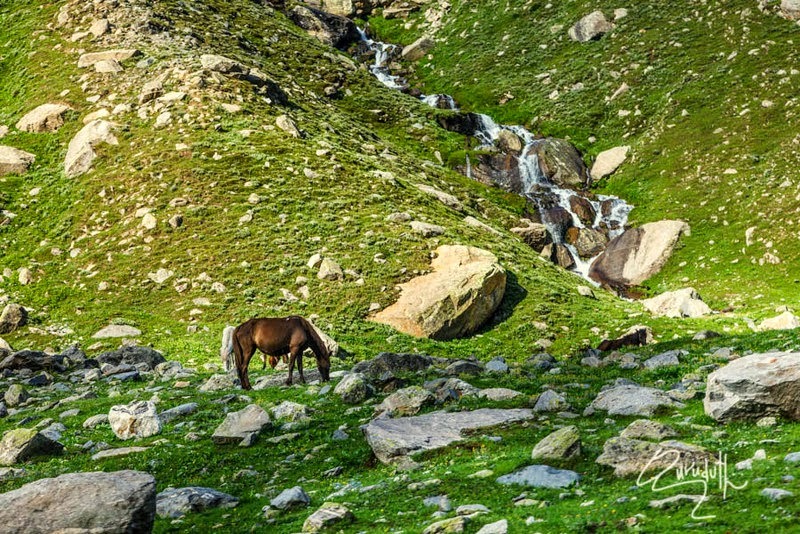 The summit of the pass turns into lush green meadow in summer studded with violets and varieties of wild Himalayan and Alpine flowers. Butterflies of numerous and rare kind and varigated hues also draw the attention of' the visitor. 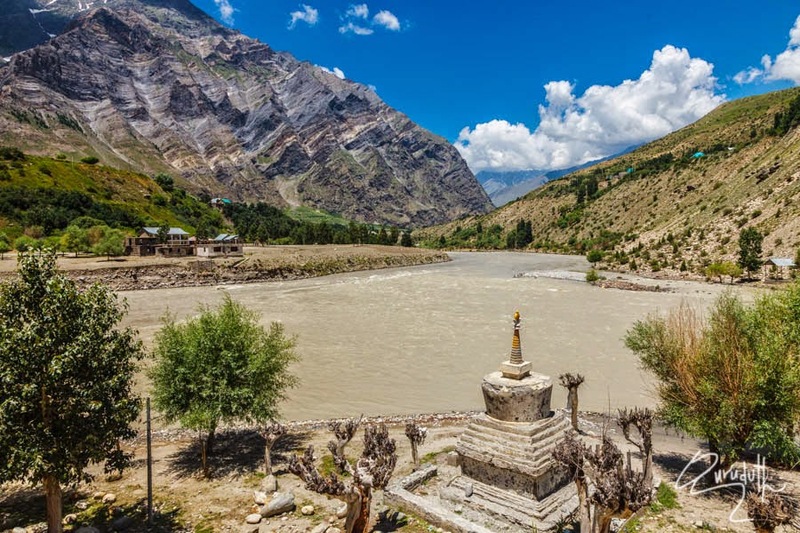 At the highest point on top to the right as one faces Lahaul, is a small stone enclosure and a water spring which is the principal source of the river Beas; .the other, Beas kund is at the head of the Solang nullah. 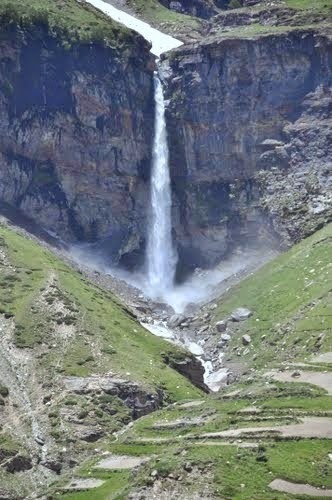 The place gained religious significance because of sojourn of Beas Rishi (the famous Vyasa Rishi, author of the epic Mahabharata. 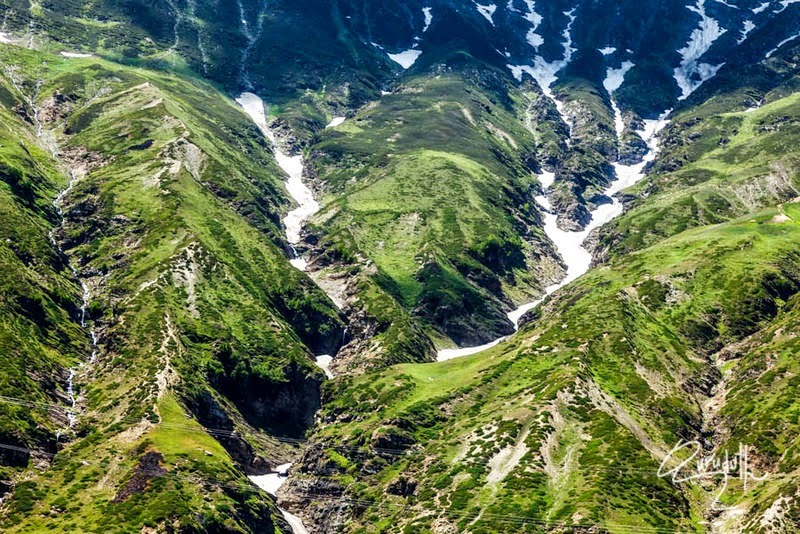 To the left of this pass is the little lake Sarkund. On the 20th Bhadon (early September) every year a large number of people visit this lake with the belief and hope that an early morning bath in it will cure all their ailments. 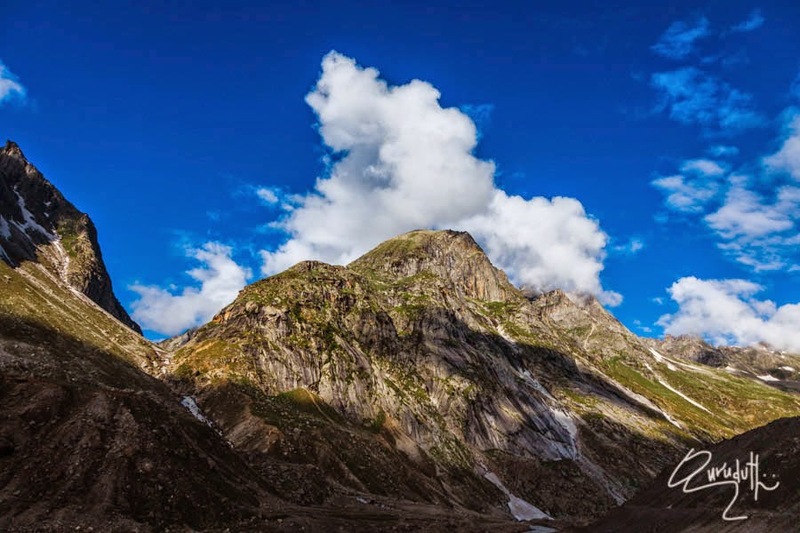 Almost directly opposite and obviously only a few kms away is the well defined Sonapani glacier. Slightly to the left are the twin peaks of Gyephang La, seats of Pre Aryan Himalayan gods Jamulu and his younger brother Gyephang. These peaks are snow streaked and snow covered. The higher peak is 5856 m. high. 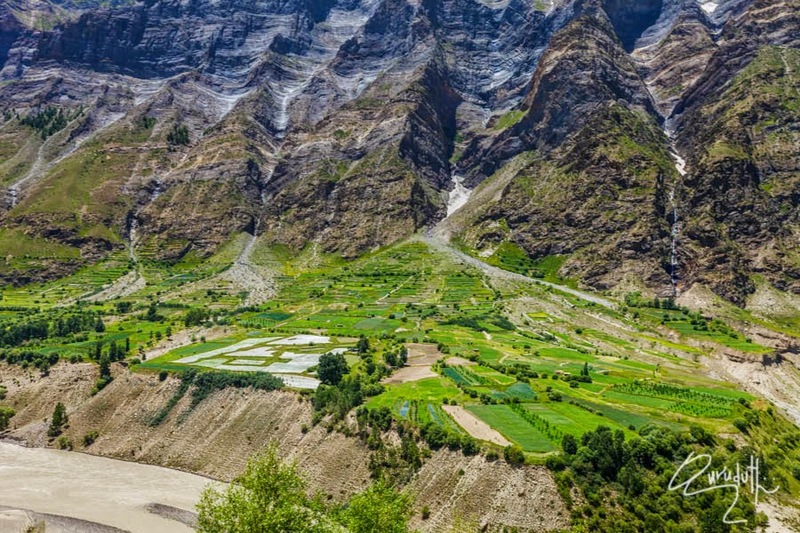 Gyephang La can be seen from Kunzom, Pangi Lahaul and from Serchu plains across the Baralacha La. 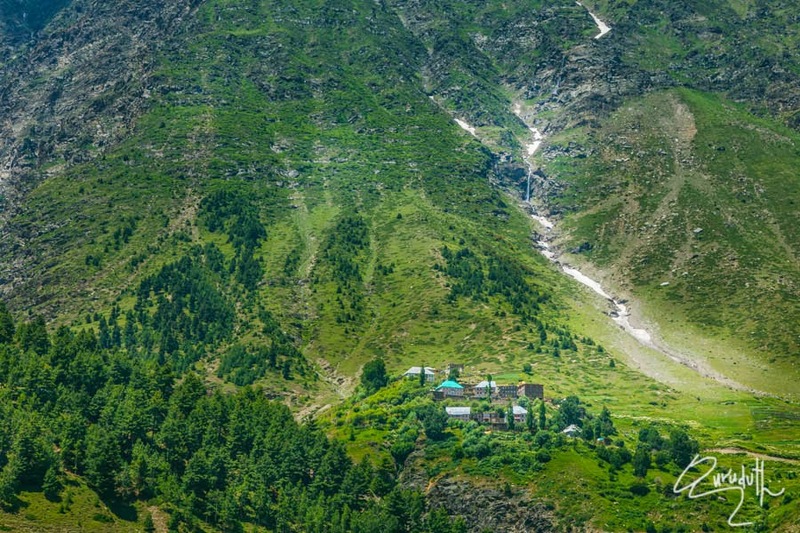 The higher of the two peaks can be seen on a clear day from as far as the Ridge in Shimla. 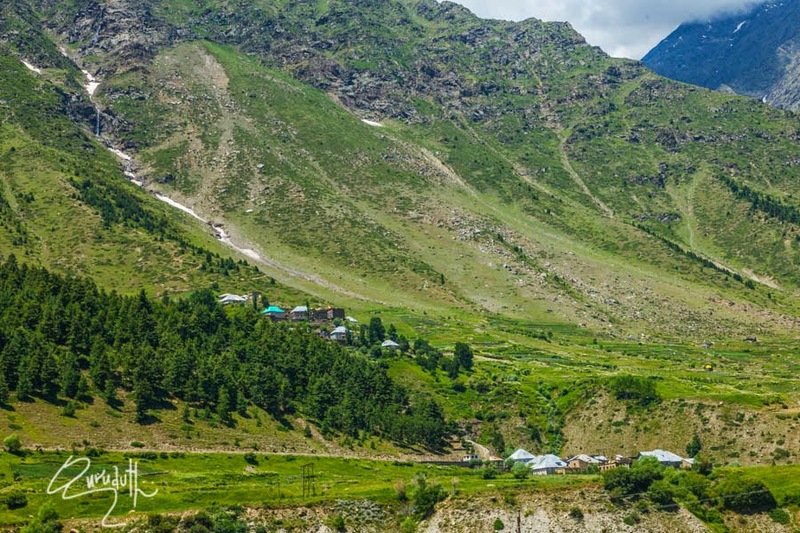 Himachal tourism buses and taxi operators of Manali provide frequent and efficient service to the tourists in the open season. Tea and snacks are available on the top. 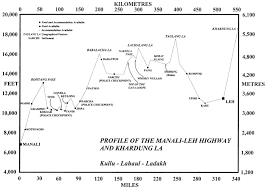 However for food one has to halt at Marhi. way. 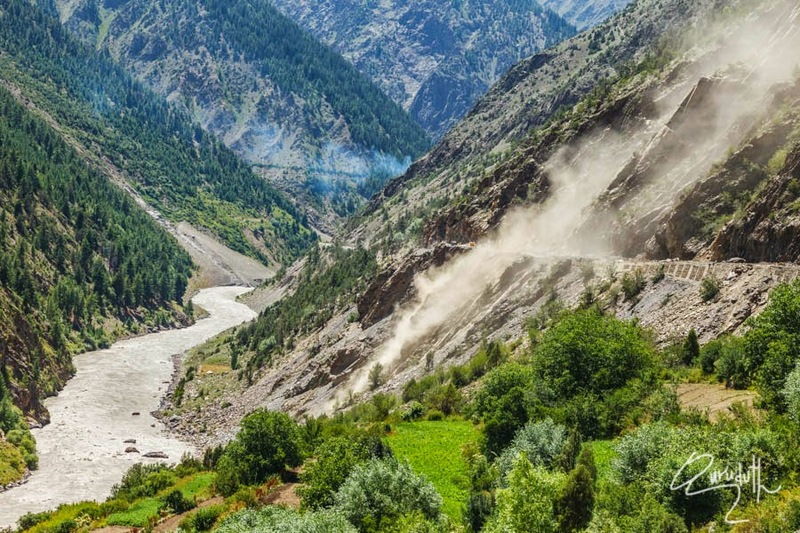 This route was once the important route, which was part of the ancient trade route between India and Central Asia, that wends its way through the breathtaking mountain views. 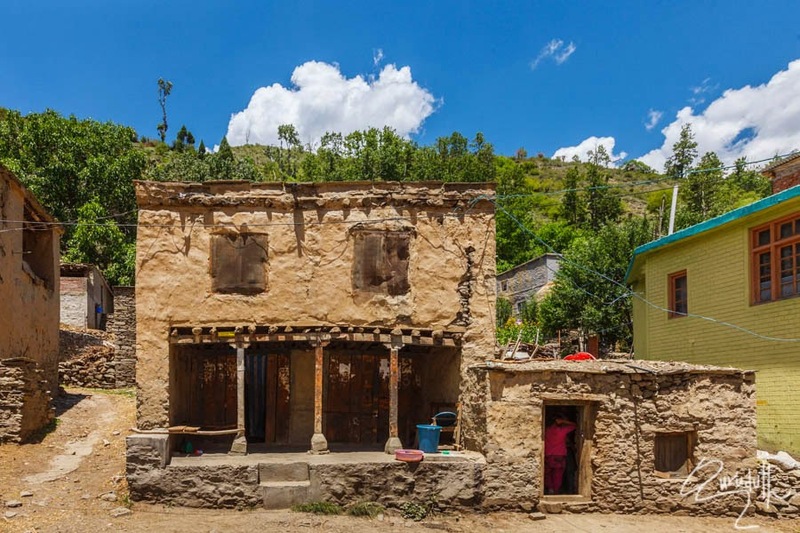 Koksar is about 6 Km from Grampoo village, situated at an altiitude of about (11,000 ft) above MSL and has a population of 650 people. 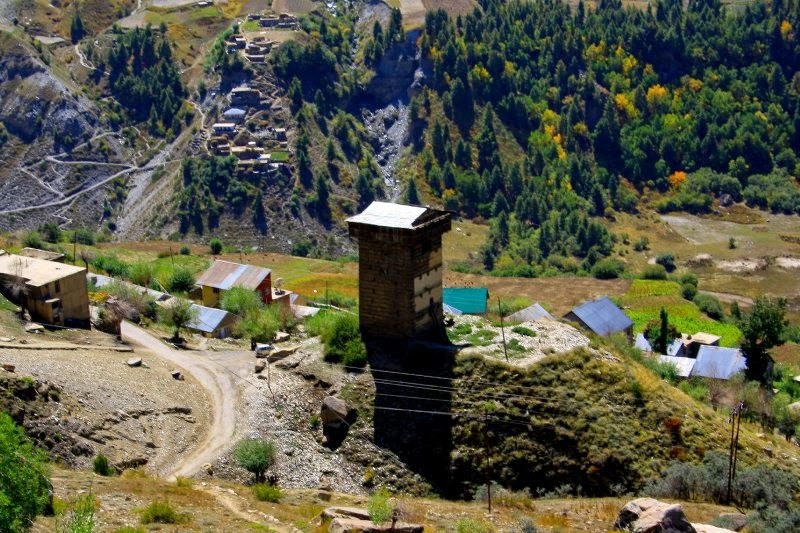 It's the very first village and gate way to Lahaul. 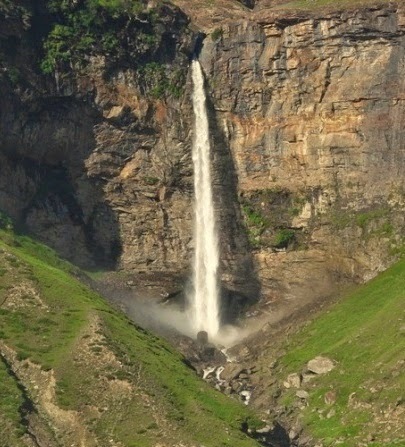 It is situated on the right bank of the river Chandra. There is habitation on the left bank also. H.P.P.W.D. rest house and Serai (Doormatery) are on the left bank. 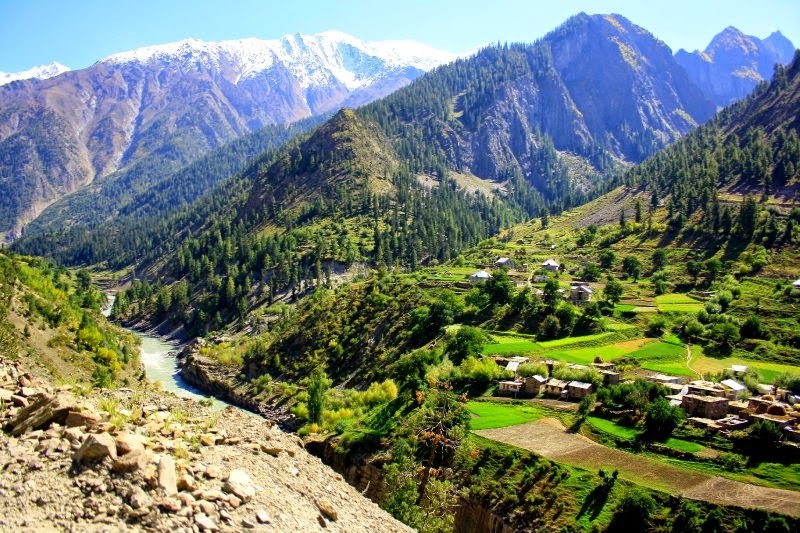 Koksar remains covered under snow during winters. 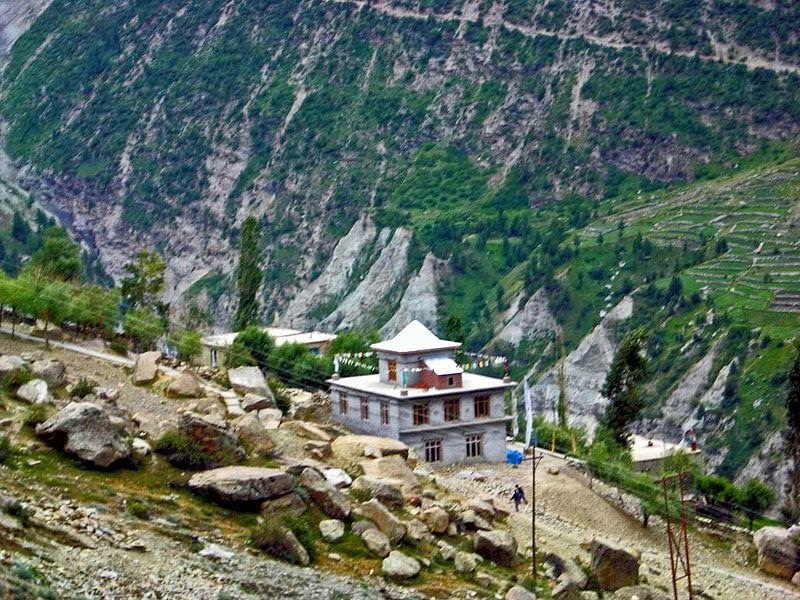 This village is surrounded by high mountains and is avalanche-prone. 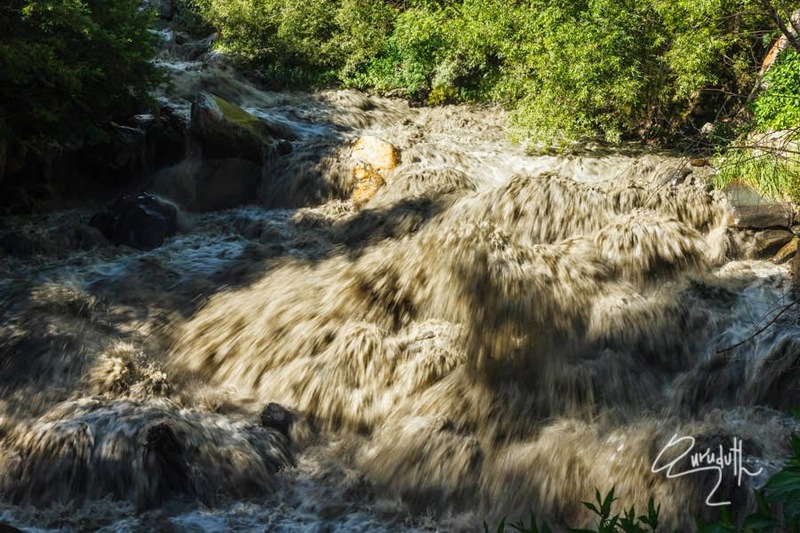 Avalanches can be seen piled up even near the river bed. 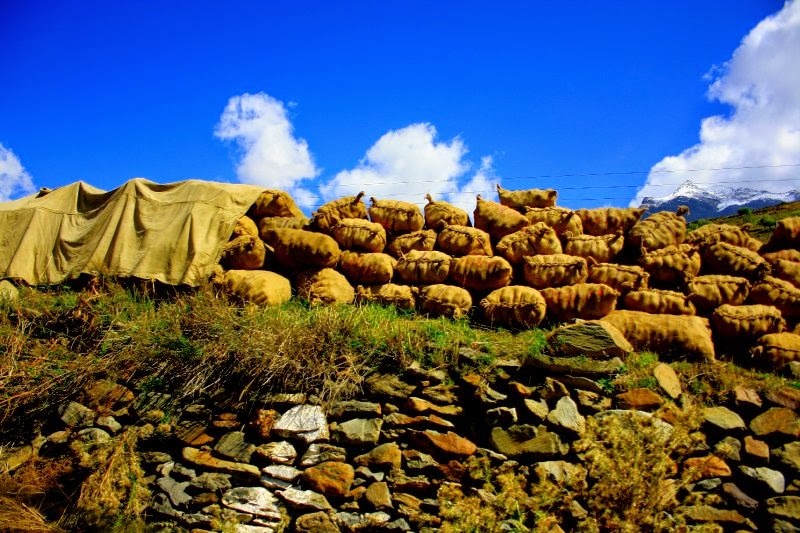 During winters Koksar is the coldest inhabited place in Lahaul. The river freezes during winters and is covered with snow to afford regular passage for human beings as also for mule traffic. 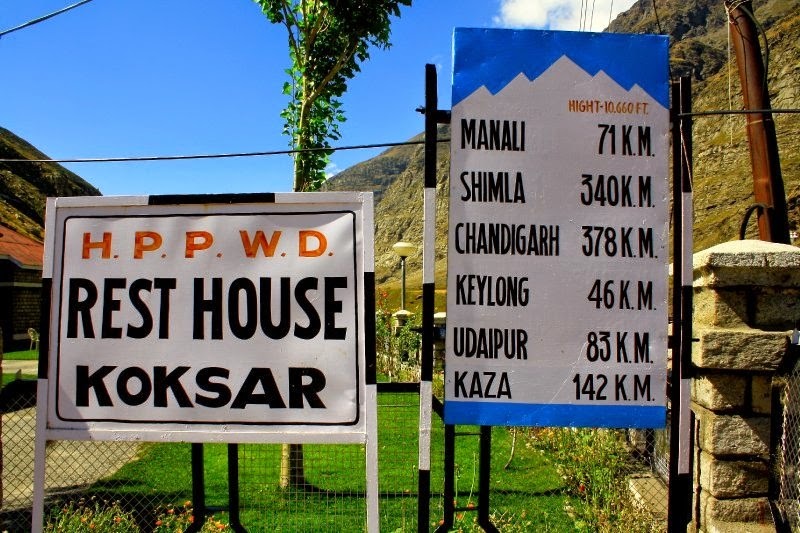 Just 6 kms ahead of Koksar towards Manali is Gramphu from where a diversion to the left leads to Kaza. 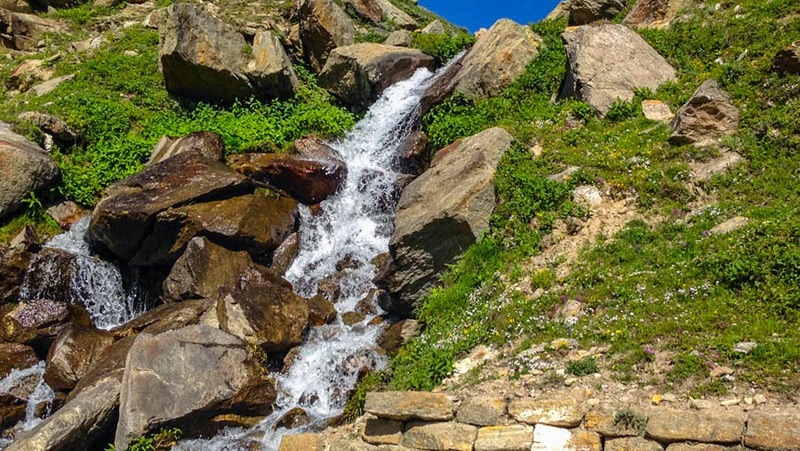 During summers rich growth of alpine flowers, beautiful potato fields and numerous water channels spell bound the visitor. Herds of goats and sheep can be seen grazing around. This may be of interest to the reader that Khoksar was on the old trade route from Indian plains to the West Asia. Police Check Post, where it is mandatory to enter all personal documents. 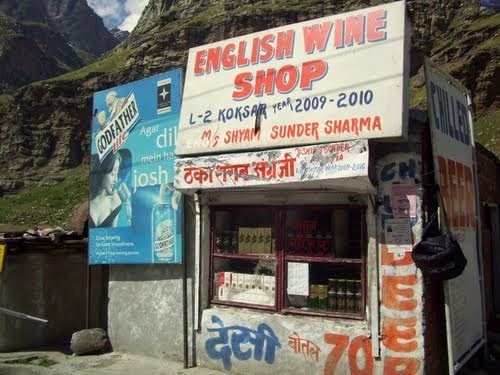 Koksar is a small village with mushroom of small eating shacks and it has a chilled Beer Shop also. Since we too were hungry, we ate our brunch of omelets, Momos and relishly sipped hot refreshing coffee. 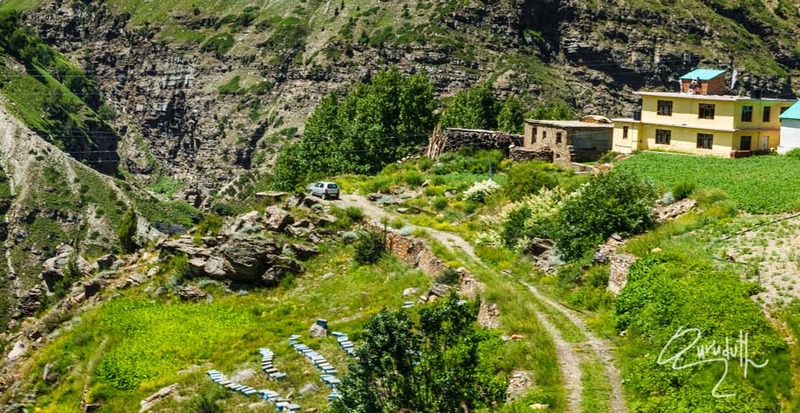 There is a Beautiful Monastery at Koksar that is nestled into a gorge of a mounain. From Koksar we drove starlight to Sissu village which is about 15 Km away from Koksar. 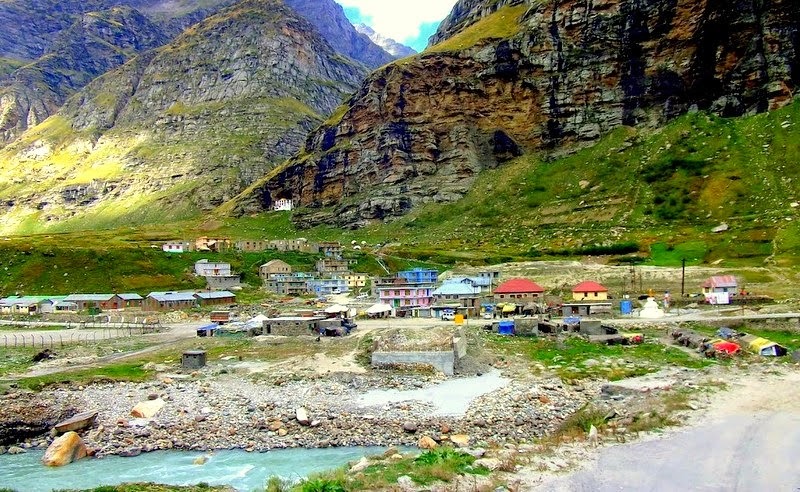 This village is situated on the right bank of the river Chandra at an altitude of 3130m. 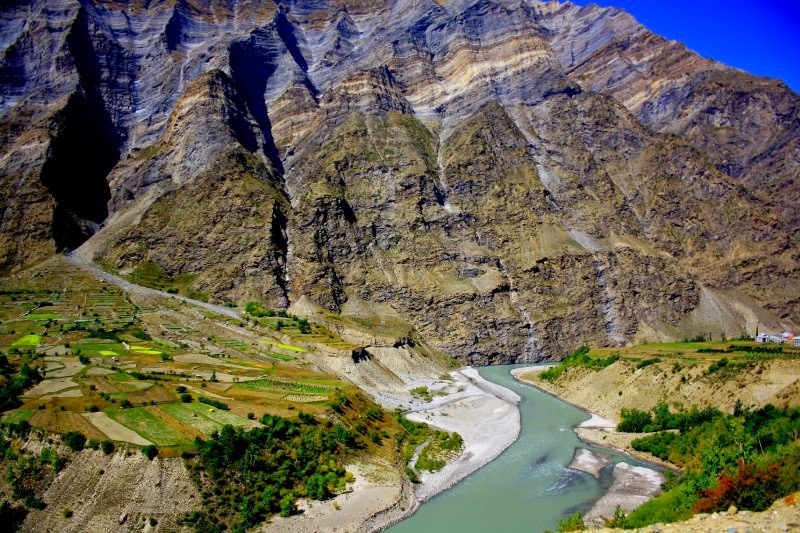 The village is located on abroad flat ground above the Chandra river. 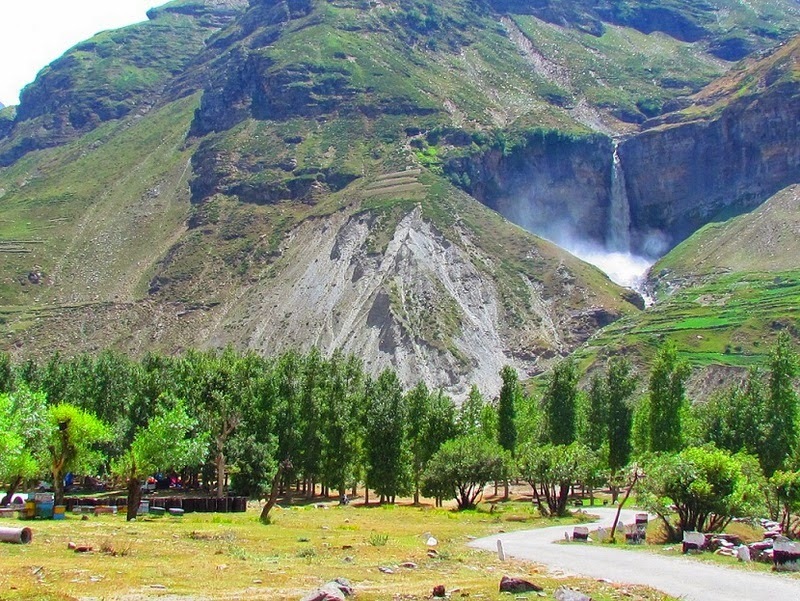 Good plantations of willows and poplars on both sides of the road are so dense during summers that at places even the sun rays fail to penetrate. The terraces are green with potato, peas, barley and buck wheat. Wild roses of white, yellow and red hues with expanses of alpine flowers deck the slopes in an unforgettable feast of colours. 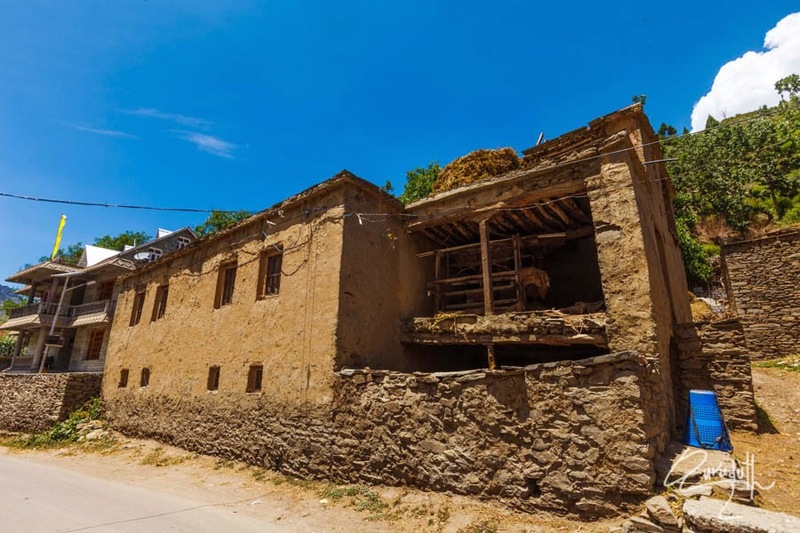 Behind the ridge on which the village is situated is the famous and most propitiated Gyephang peak. 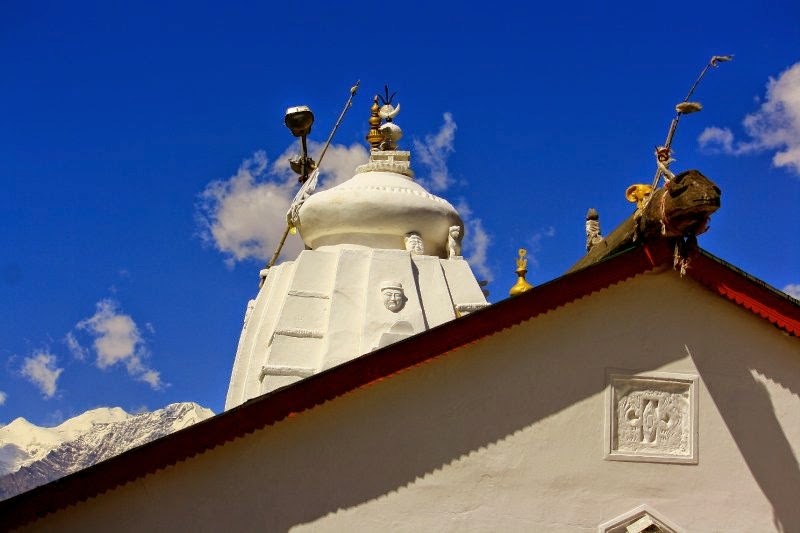 Lord Gyephang or Ghepan is the presiding deity of Lahaul--the protector of people. 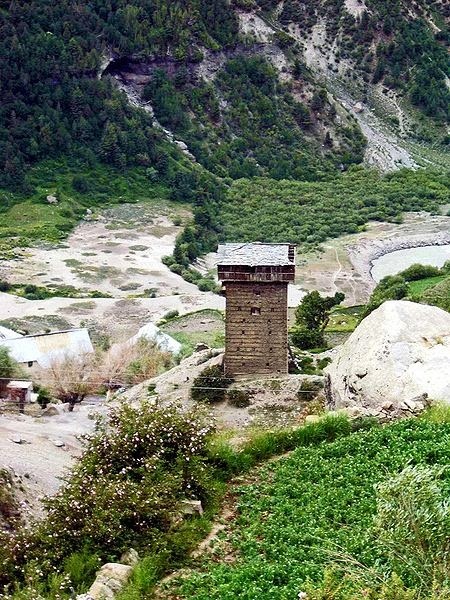 In olden days people of Lahaul fought, their wars under the banner of Lord Gyephang. The temple of Lord Ghepan is in this village. The temple is not open to outsiders. Once in two/three years the deity is taken out of the temple in a procession. 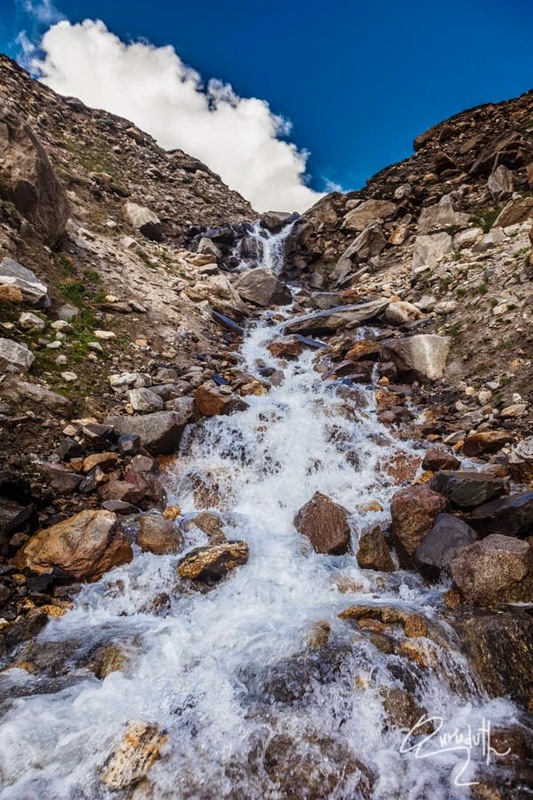 A little short of the village is the Sissu nullah which flows down a narrow gorge from tho Gyephang peakglaciers. 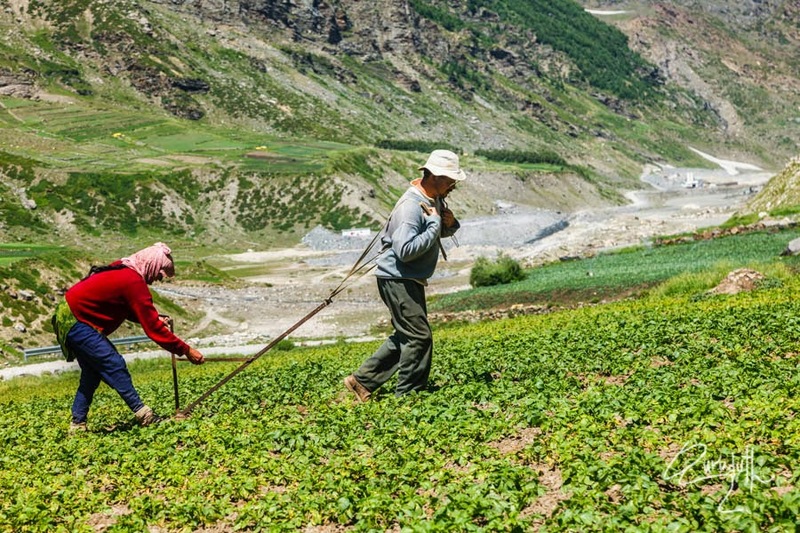 At Sissu we were amazed and saddened to see one poverty stricken middle aged couple, who were ploughing their small patch of agricultural land by themselves. May be they were so poor that they couldn't even afford a cow or a Bull to plough their small piece of land. 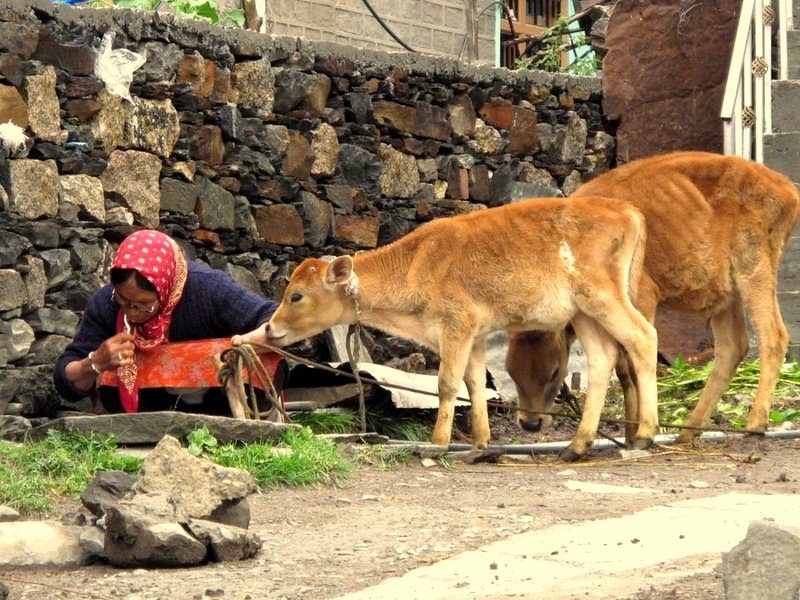 It was so heart-wrenching, pathetic and depressing to see such hardship and poverty. 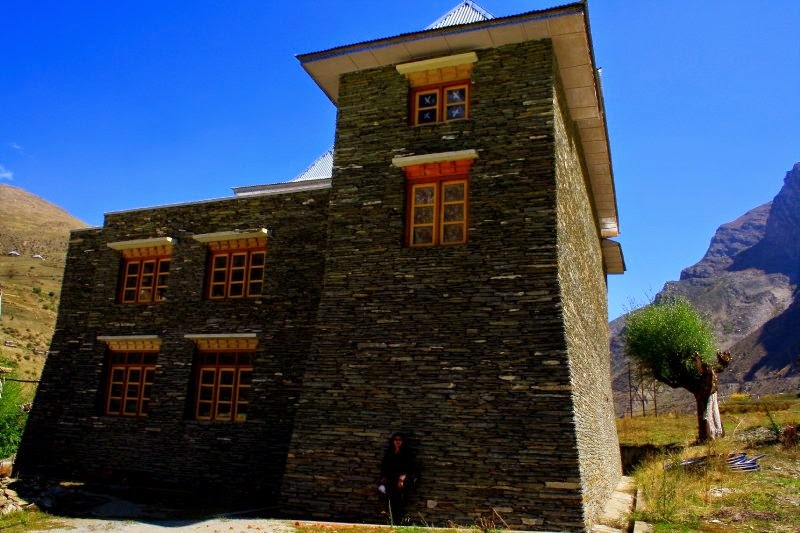 House of the Thakur of Gondhla, called the Gondhla castle or fort, attracts a large number of tourists. 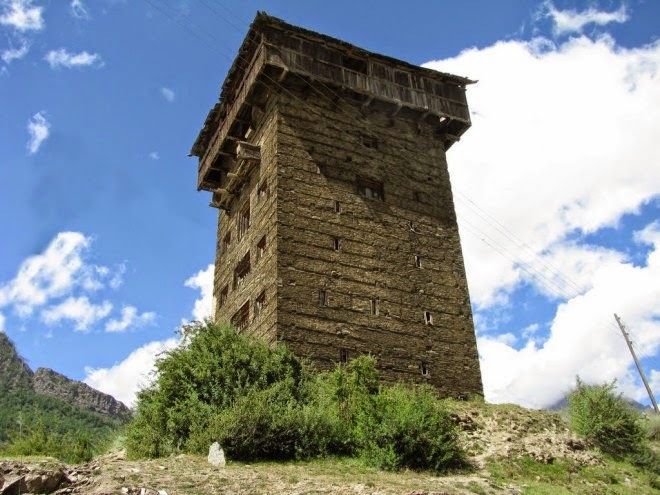 The Present Thakur Fateh Chand would like the tourists to believe the Fort is about 20 generations old, but according to the District Gazateer of Lahaul and Spiti the fort was built in 1700 A.D. by Raja Man Singh of Kullu whose influence stretched upto the Lingti plains beyond the Baralacha-la. This Raja also married a daughter of the Gondhla family to cement his ties with the Thakur. The fifth storey was exclusively meant for the Thakur. 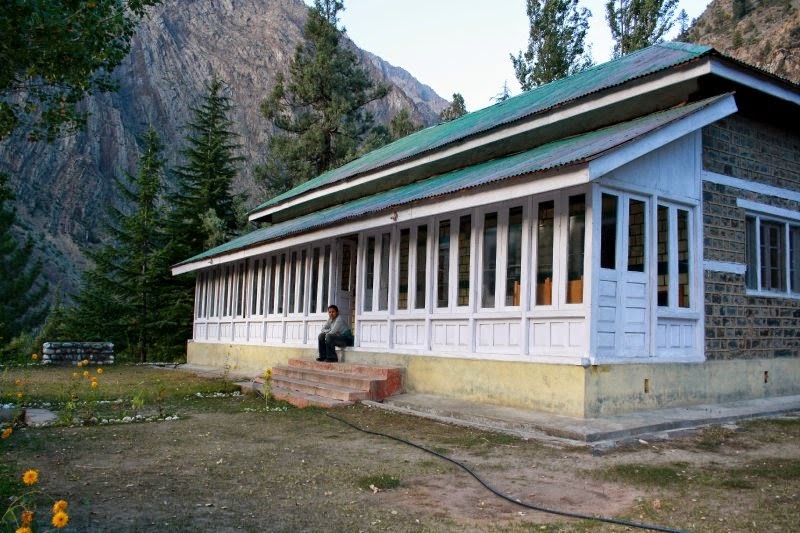 It consisted of personal prayer chamber and a verandah from where the Thakur used to listen to the public and later pronounce his judgements. Once the walls of the prayer chamber were painted all over in stone colours. Forty volumes of Kangyur can still be seen littered around and carelessly stacked on a wooden rack. Ganesha as the main deity carved on the facade of the prayer chamber. In one of the prayer chambers the window connecting the outer room is an exquisite work of wood carving. 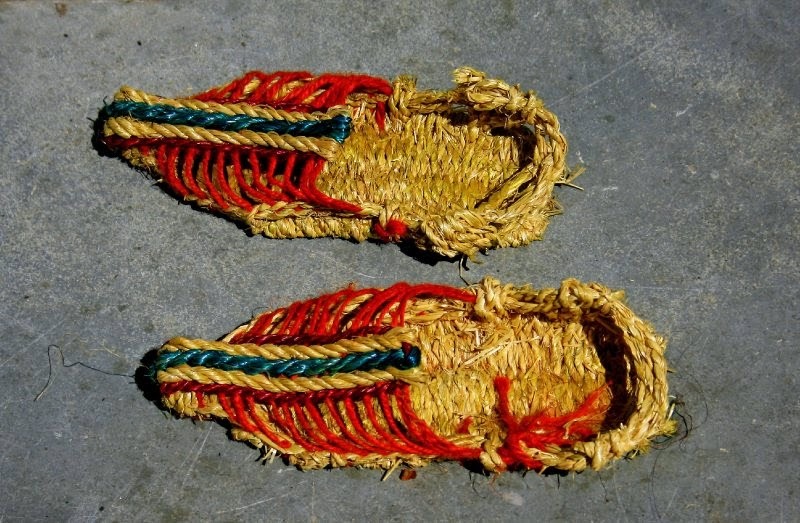 The 'jali' (net) carved on a single piece of wood looks exactly like the cane work. 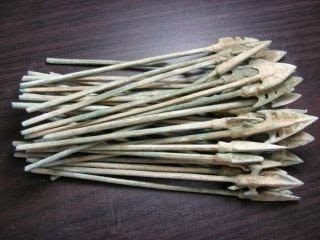 Several weapons including bows, arrows, quivers, catapults, guns and canons beside other articles of antique value can be seen rusting in the apartments. Age old costumes, furniture and idols are also strewn around in a state of neglect. 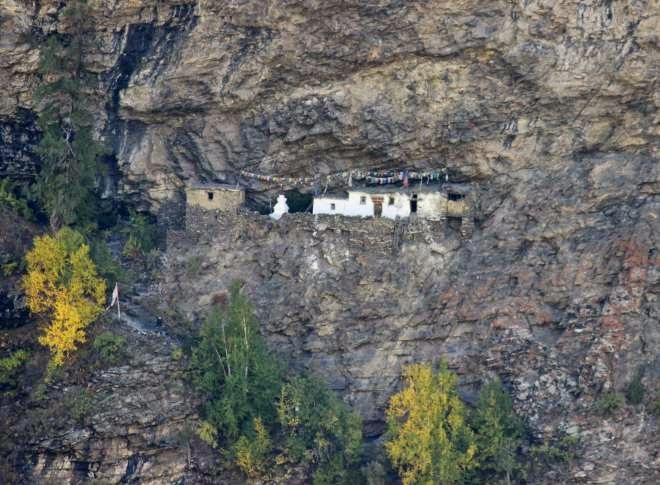 The Thakur is negotiating with the Department of Language and Culture of Himachal Pradesh to sell it as he finds it difficult to maintain this structure. Another interesting article to be seen in possession of the Thakur is Sharab Raldi, i.e., "the sword of wisdom" as Sharab means wisdom and Raldi means a sword. 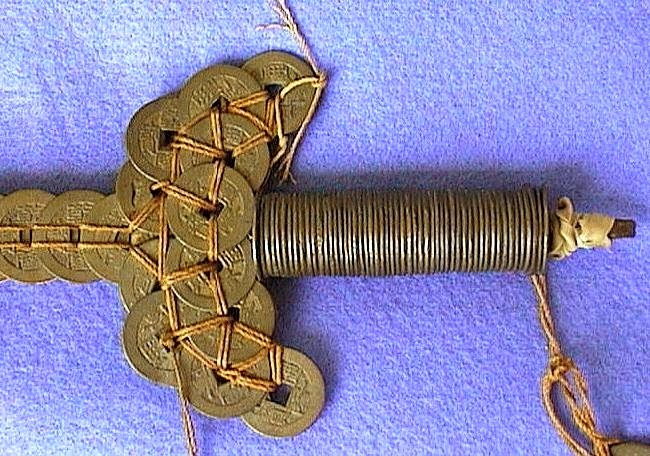 Sword of wisdom (sanskrit Pragya Kharga) has great importance among the Tibetans. 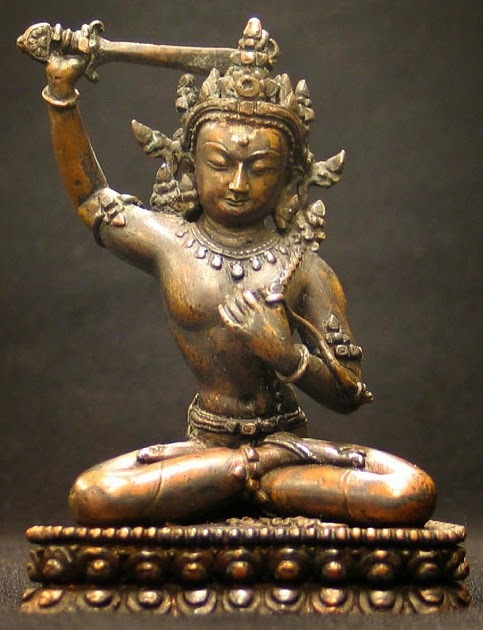 Manjushri is the Tibetaa god of wisdom and he is always portrayed carrying this sword of wisdom in his right hand. According to the Thakur this sword was given to one of his ancestors by His Holiness Dalai Lama when that ancestor had fled to Tibet sick of the designs of the local people. This sword seems to have been built in the Toledo technique of spain. This technique is stated to be superior to the Sheffield technique. In Toledo thin steel wires are beaten with a hammer to obtain the desired shape of a sword or other like weapon. One can really observe thin lines in the length of the sword. Earlier this sword was never shown to the outsiders but now an insistent visitor can see this prize sword of the Thakur. So, we had to fill fuel into our car to its full capacity. After refilling fuel we drove towards Keylong. To continue our journey we had to drive over a strong steel bridge that is built across Baga River. 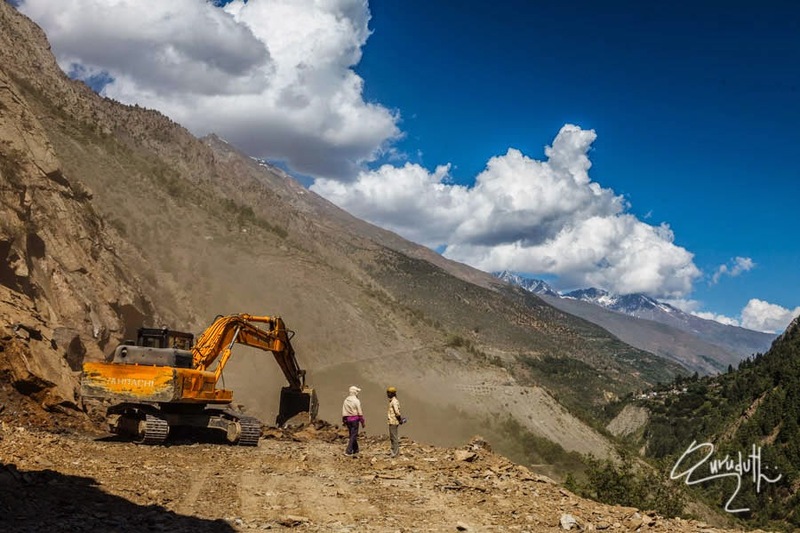 The above picture is of the temporary make shift road which connects at a junction for Keylong and Udaipur, after crossing Tandi bridge . Just before Keylong there comes a junction of roads, where one road leads to Keylong and the other one leads to Udaipur. 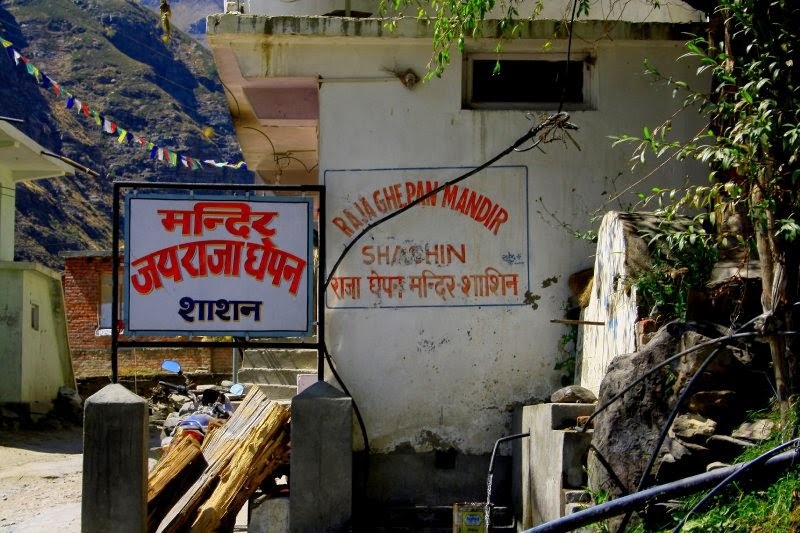 Though we had to go to Keylong, but by mistake I took the road which goes to Udaipur and Trilokinath town that is about 60Km from this junction at Tandi. I didn’t realize that I have committed a blunder by taking the wrong road. As we drove on, the road was miserably bad. It was full of deep potholes, badly worn-out with endless stretches of shooting stones areas. Just to cover 60Km we took nearly three hour. Somehow we managed to reach Udaipur town. And the best joke is that we didn't realise that we were driving on the wrong track. By the time we reached Udaipur town, it was past lunch time. As we were having our lunch, one of the co-customer at the restaurant asked us were we heading to. 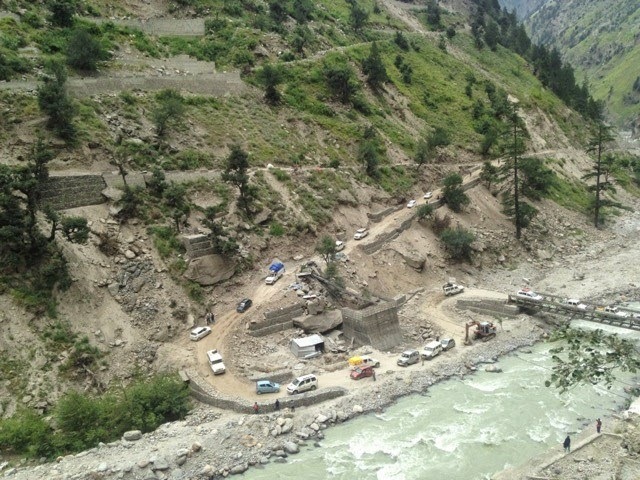 We said that we were going to Leh Via keylong. Listening to us he had a hearty laugh and told us that to go to Leh, we had taken the wrong road. 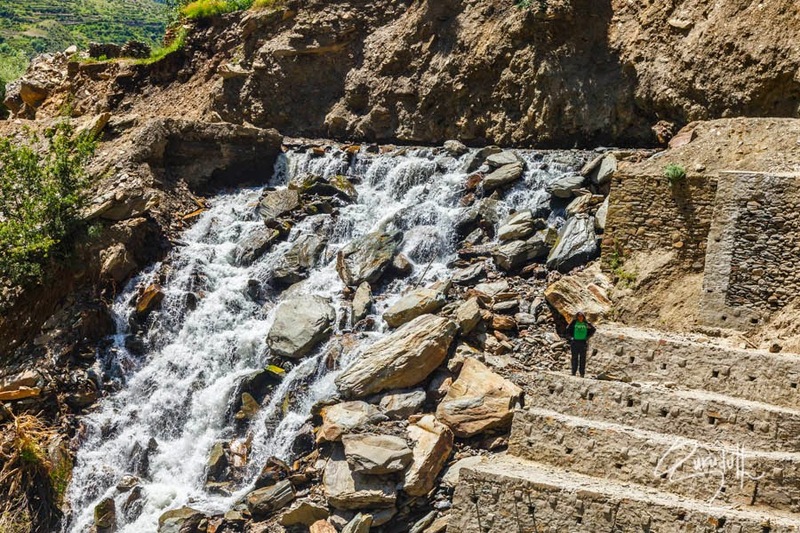 He told us if we traveled another one and half hour further on this road, it would reach us to district Chamba that is near Dalhoise / Pathankot. We were shocked to listen to him. So in this process of driving up and down on the wrong road we lost about six hours. 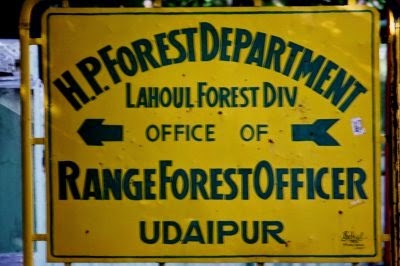 Anyway since we had reached Udaipur, we decided that for the night we would stay here at Udaipur Forest Guest House. Having come here we thought of visiting Udaipur and Trilokinath also. 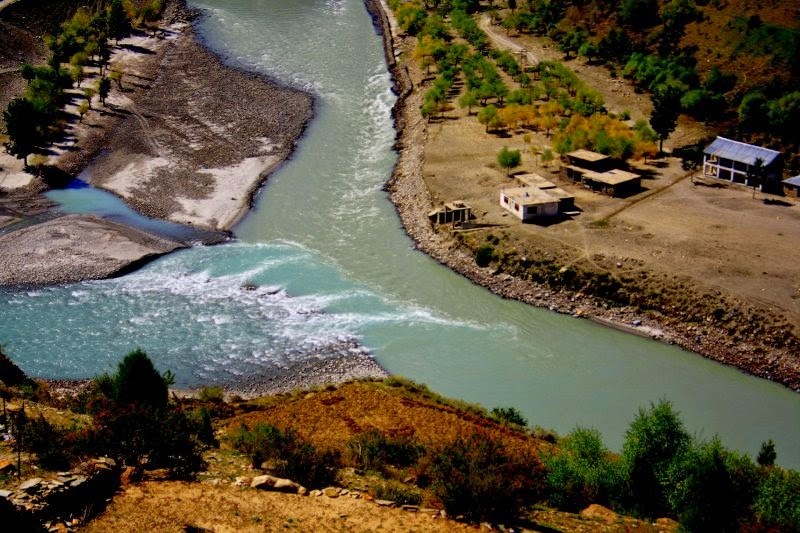 This sub-divisional headquaters is situated at the junction of the mighty Mayar nullah with the main river Chandrabhaga. 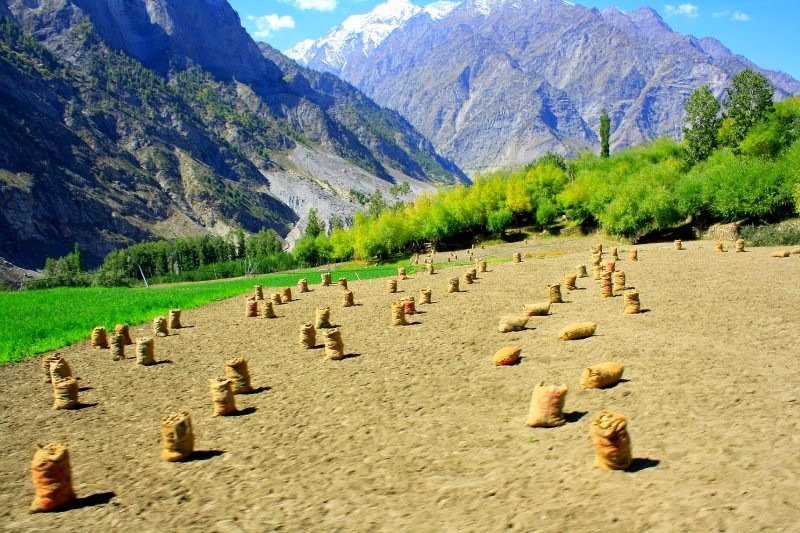 Situated 53 kms away from Keylong, earlier this village was known as Margul or Markul. 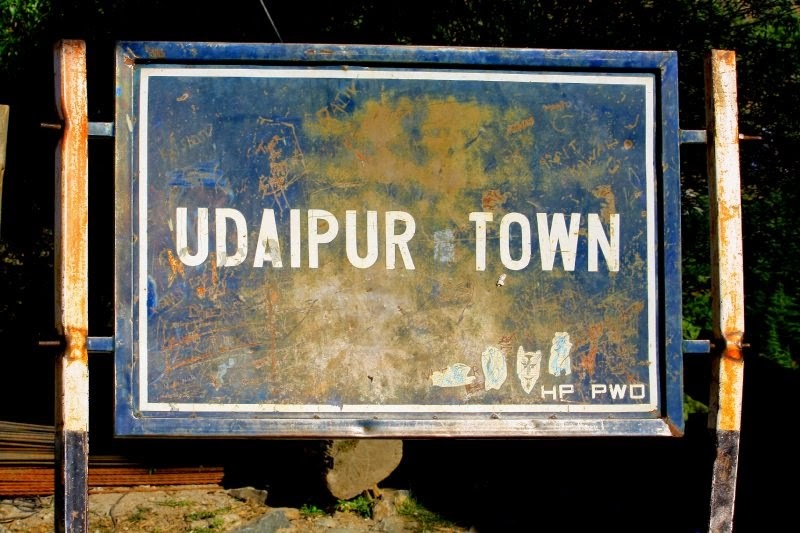 Around 1695 it was renamed Udaipur when Raja Udai Singh of Chamba (1690-172'8) raised it to the status of a district centre in the Chamba-Lahaul which his father Chatter Singh had annexed to his Chamba state. 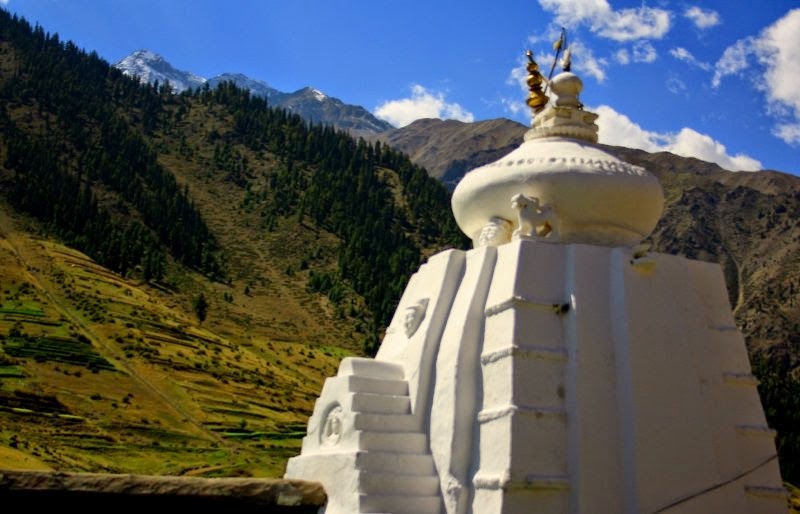 The temple is built in the classical style introduced in the hills in the 7th and 8th C. As is typical to the style this temple consists of a curvilinear stone tower (shikhara) crowned with the characteristic 'amalka' (imitating a segmented gourd). Like plains there is no pillared hall (mandapa) in the hills perhaps owing to non-availability of clear ground. 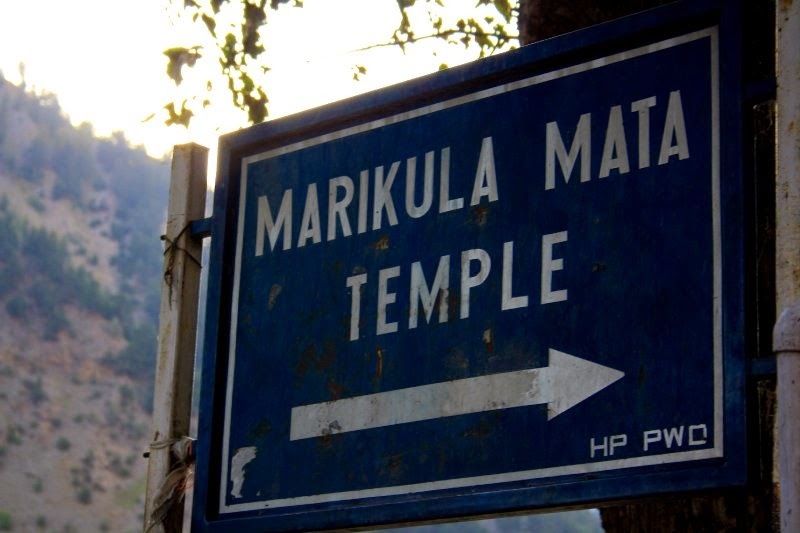 The Markula Devi temple goes back to Ajayvarman's reign in Kashmir, though no original work of so early a date survives. But part of the Markula temple has been copied during repairs in the 11/12th and 16th C. The phase of Kashmiri art in the 11th and 12th C in its transition to the Lamaistic art of Western Tibet is represented by the inner facade of the temple; main characteristic of this transitional phase being three headed Vishnu images. Markula's wood carvings belong to two different periods, the earlier one consisting of the facade of the sanctum sanctorum and the ceiling and four main pillars of the mandapa; arid the later one consisting of two additional pillars, the dwarpala statues on both sides of the facade, window panels and the architraves supporting the ceiling. The exterior of the temple is most ordinary as it had to be renewed time and again because of vagaries of nature. The temple is the usual structure of timber-bonded stone. 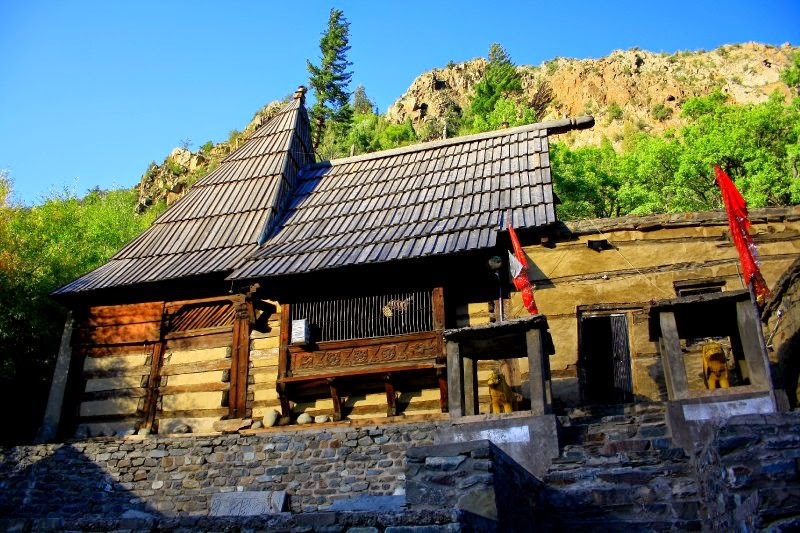 The temple is covered with a steep gable roof of wooden shingles in a steep pyramid looking like the Shikhara temples in the plains. The interior, however, is rich in artistic quality. The ceiling consists of nine panels of different size and shape. Eight of these border the big centre piece. The centre piece, is in the Lantern style. The 'kirtimukha' masks on this centre piece are characteristic of the 7th and 8th C. Four figural panels on the four basic directions depict Gandharvas busy with their mates and holding objects like crowns, bracelets, jewels and charnaras, etc. Their dance, poses are those of the Bharta Natya andthe costumes resemble the late Gupta period. Also shown are Nataraj and Gauri with dancing Ganas. Shiva on both sides is flanked by his alter egos, the Bhairavas. The next panel deviates from the Hindu pantheon or myth for it represents the "Assault of Mara". 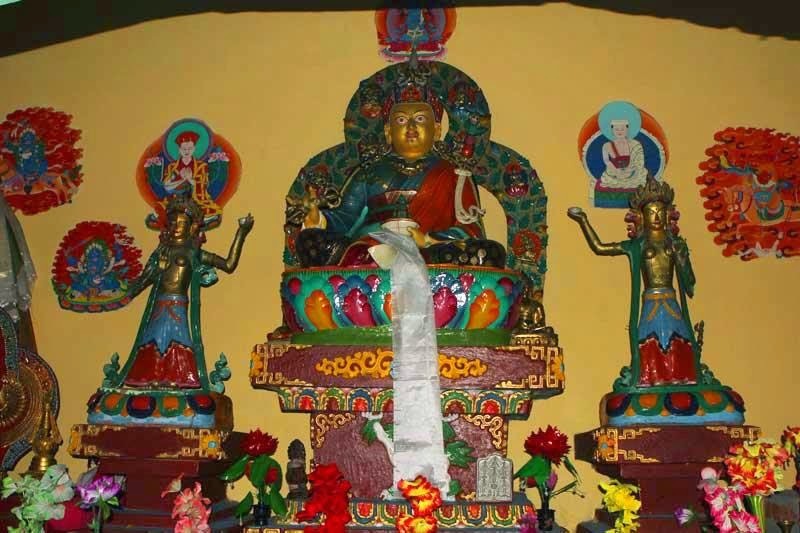 In the centre Buddha is shown sitting on the Vajrasana inBhumisparshasana calling the Earth goddess to witness his victory over Mara or the god of Lust and death. 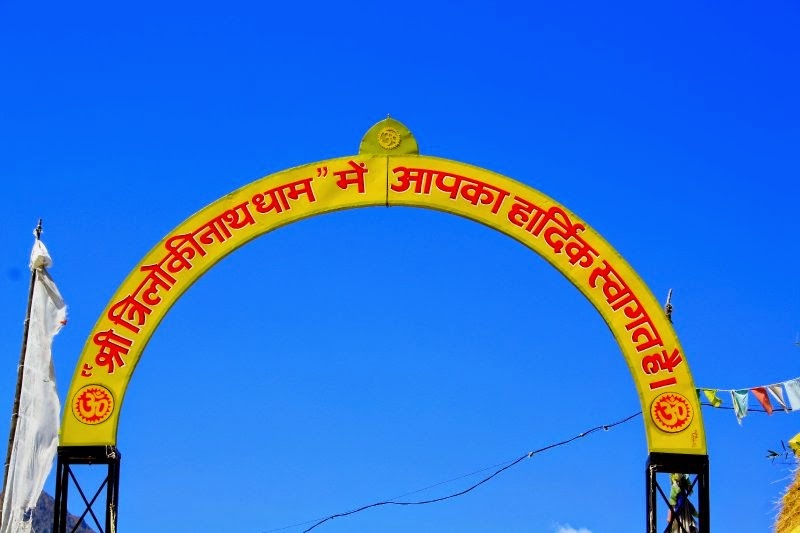 Local population believes this temple to be the work of the master craftsman who built the famous Hidimba Temple at Manali for Bahadur Singh of Kullu. Historically this theory sounds plausible because Pratap Singh was the son-in-law and close fried and ally of Bahadur Singh. There is striking similarity between many figures and other details of the later wood carvings to the relief's of the Hidimba Devi Temple. 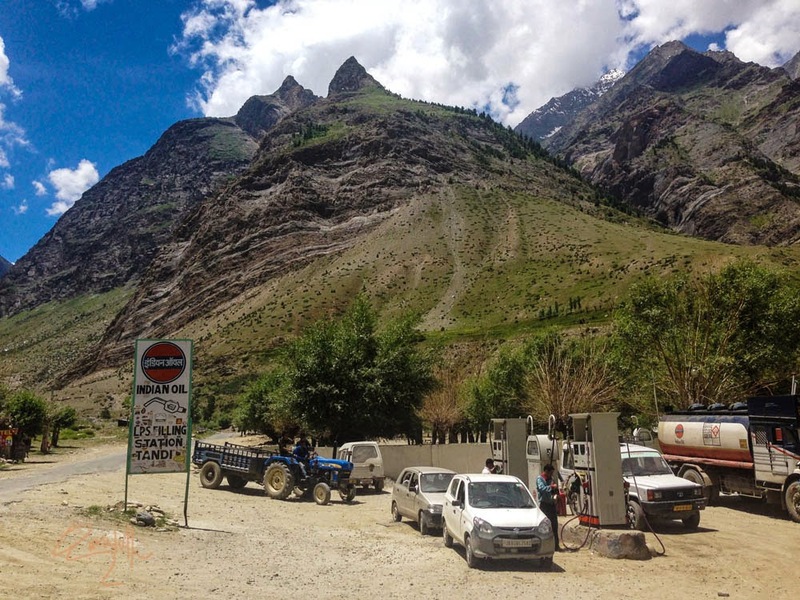 After finishing visiting both Udaipur and Trilokinath temples, and after finishing lunch, we drove staright towards Jispa via Keylong. The next chapter of my Blog to be continued. Ashok, another great chapter on your fantastic trip. What an adventure! The grand City Palace of Udaipur, worked by Maharana Udai Singh additionally the originator of city of Udaipur.